Happy Tuesday FB and INSTA FAM! 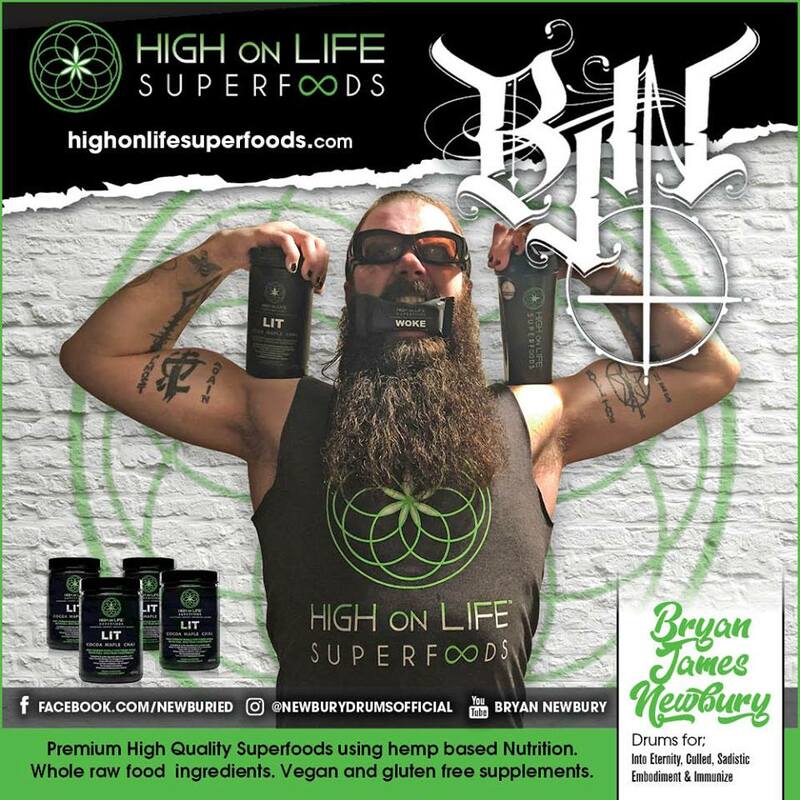 I am EXTREMELY PLEASED to announce that I have officially joined the @highonlifesuperfoods family of endorsed athletes! I am so proud to part of a team of such incredible EXTREME ARTISTS such as Gene Hoglan and Jason Bittner to name a few! My journey with health, fitness and nutrition spans most of my life and the entirety of my drumming career. Crippled by spinal injuries at a young age, I was told by doctors that if I was to live a long, healthy, PAIN FREE life that included EXTREME METAL DRUMMING, major changes would have to be made. After many hard years of rehabilitation, trial and error, training, and research in performance dieting, I was able to not only RECOVER from injury, but I was able to take it a step further. Now, with the help of NEXT LEVEL products like these, I am able to reach newer heights of strength, endurance, health and vitality than I ever though possible. @highonlifesuperfoods have given me that extra BOOST that I need to get the job done, in the GYM and on the STAGE. Do you want to experience your best SELF and the best PERFORMANCE of your life? The answer is simple. Get yours NOW! PM me for your FREE PROMO CODE to get some EPIC DEALS! 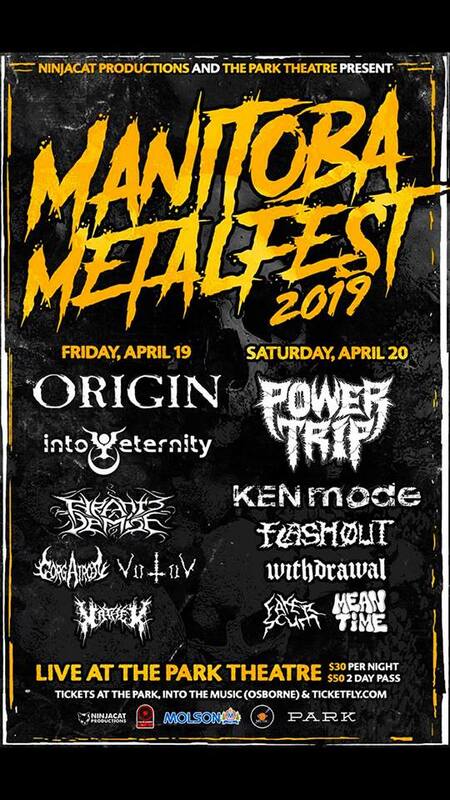 We’re pumped to be playing in Winnipeg again soon! New Endorsement Announcement From Our Drummer! WELL THE CATS OUTTA THE BAG PT. 2! 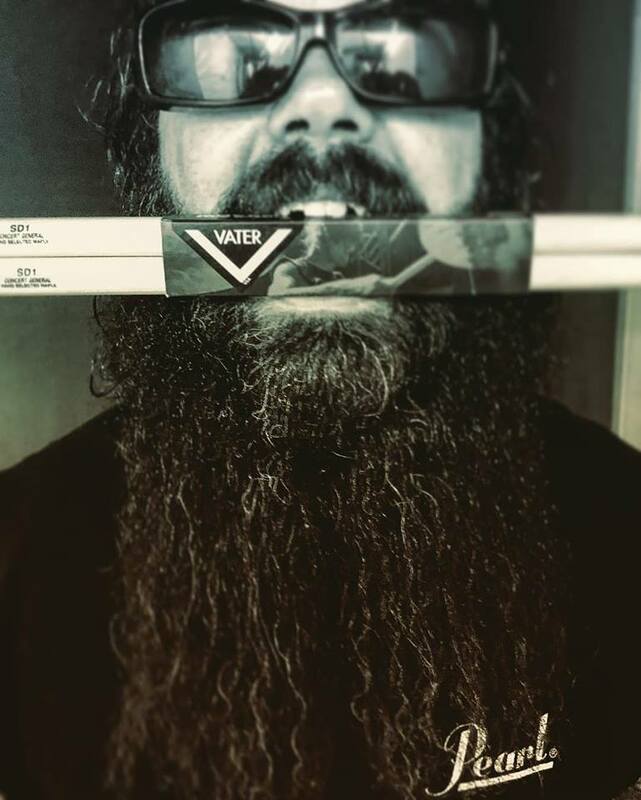 I am extremely proud to announce that I am officially a member of the @vaterdrumsticks Canada family of endorsed artists! Over the past 17 years, I have tried just about every stick on the market. As you grow and become more proficient at your craft, your body, technique, strength, and your dexterity changes and you must change with it. When I was younger and influences ran high, I was overly and unabashedly enthralled by the style/technique of the late, great OG BMF @vinniepaul3 . The baseball bat way, with or without gloves has been a staple in my playing for as long as I can remember, and I haven’t looked back since. After several years and many bands later, I met and became friends with fellow hard hitter and fit drumming phenom @brettduncandrummer . Eventually after much discussion, we realized that we both shared the love of the same style and model of drum stick. There are many companies that make a Maple Wood Tip Concert model but I have literally #chewed my way through thousands trying to find one that plays like butter and doesn’t fall short on quality or durability. Recently Brett tossed me a pair of the @vaterdrumsticks #sugarmaple #sd1 #concertgeneral #woodtip #drumsticks and said CHECK THESE OUT. Within 20 minutes of my daily warm up, I noticed an immediate comfortable, familiar feel. I decided to buy a half brick in preparation for my next arduous recording session. Any artist knows the need for quality microphone signal requires your heaviest striking possible, there is nothing like the performance needed for tracking when it comes to putting sticks to the test. After 4 hours of relentless abuse, rim shot after rim shot, the one pair I used were barely cracked, fulcrum still intact and ready for more. Not only did these sticks stand up to my attack, they were also so very forgiving and I managed to pull off one of my best performances to date, and I won’t be looking back any time soon. Watch It Go! 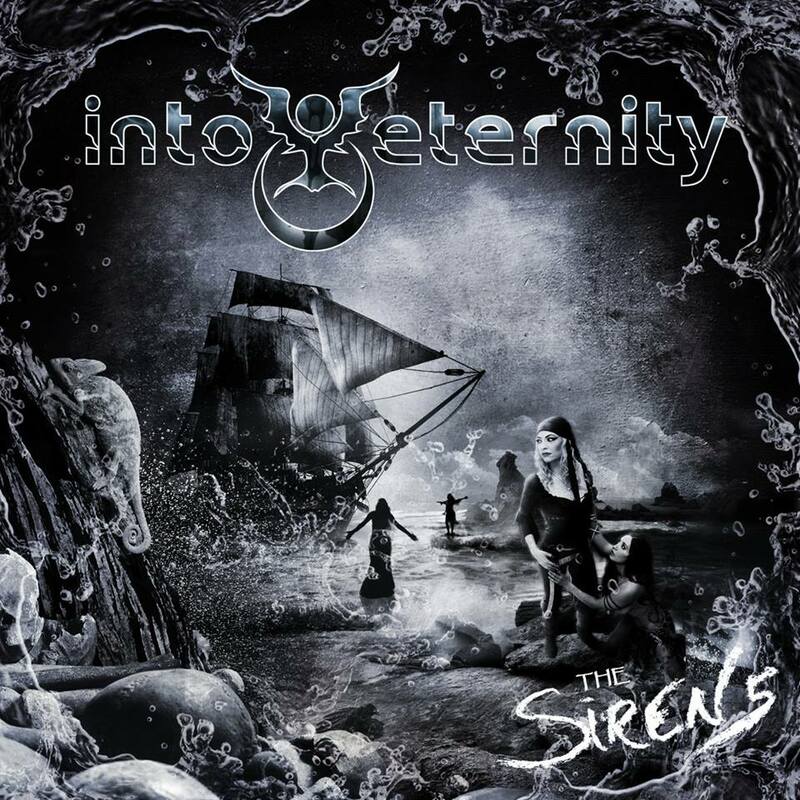 New Into Eternity album, The Sirens, in stores and online now. First new album in 10 years full of our brand of progressive metal introducing our new singer Amanda Kiernan. Press release from our drummer Bryan! WELL THE CATS OUTTA THE BAG! 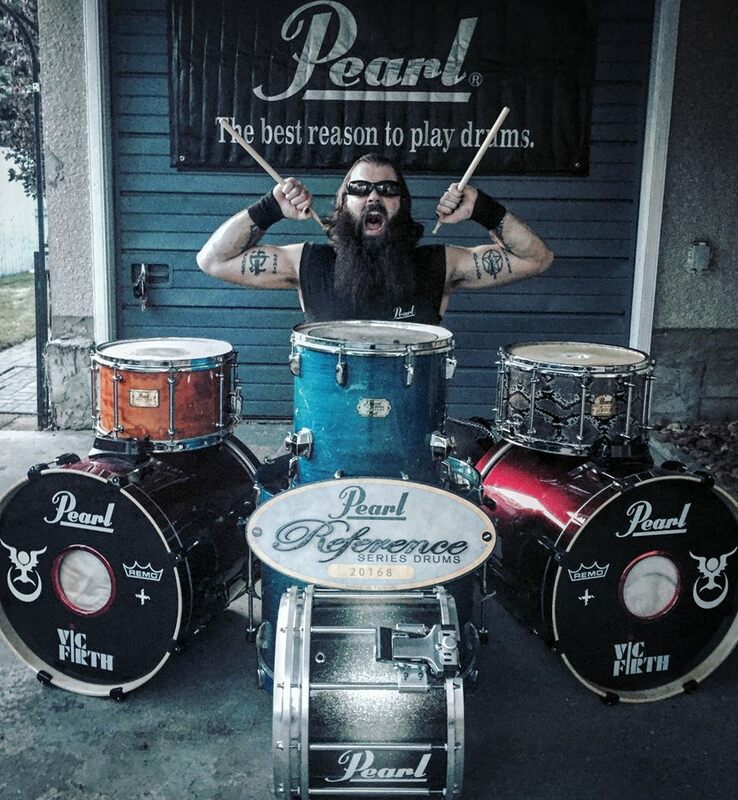 I am extremely proud to announce that I am officially a member of the @pearl_drums Canada family of endorsed artists! Ever since high school, I have been enthralled by the look, sound and feel of @pearl_drums . I bought my first kit at age 15, and haven’t looked back since. I worked very hard throughout my teens and into my 20’s, honing my skills, style and technique, focusing on faster, more aggressive music—the kind that adrenalized my soul and would eventually lead me towards my creative calling. As I aged, I discovered the grand spectrum of the metal music industry, filled with unbelievable drummers such as @therealgenehoglan @flomounier and @vinniepaul3 . I witnessed these performers demonstrate percussion techniques that blew my mind on beautiful handcrafted @pearl_drums . Having experienced health issues (degenerative discs) at a young age, I felt that I would never be able to achieve what those I looked up to had done. It was that feeling of self-doubt that provoked me to work very hard at re-building my strength over time. Although watching, meeting and eventually becoming friends with these veteran musicians would make me feel inadequate at times, it just as often had the opposite effect by providing me with the inspiration to work harder and push forward with my own music, health, and playing. @culled.ca @sadistic_embodiment_band @immunizemetal and @untimelydemise to name a few. I sit before you today, back where it all started #thegarage ! This is where my journey began and I will never forget where I came from and who helped me get to where I am now. With the love and support of my friends/family/bandmates @pearl_drums, @sabiancymbals_official , @vicfirth and @teamallmax I was able to reach new levels of performance, fitness and success than I ever thought possible. And I’m just getting started…… WATCH IT GO!! New Record Deal With M-Theory!! 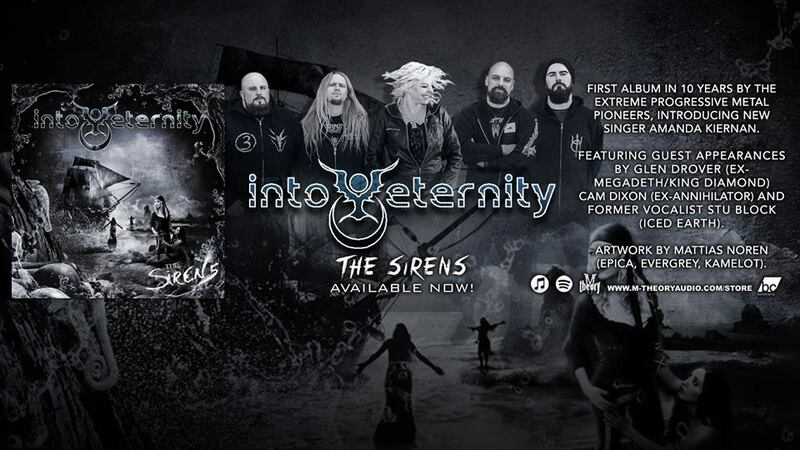 Acclaimed Extreme Progressive Metal Act Into Eternity Signs With Salem Rose Music & M-Theory Audio; Long-awaited sixth album ‘The Sirens’ due Oct. 26 on CD, LP and digital! New song online off upcoming album “The Sirens”! You might have already seen the news on social media: we are extremely excited to finally announce that we are releasing our long awaited album, “The Sirens”, August 3rd! 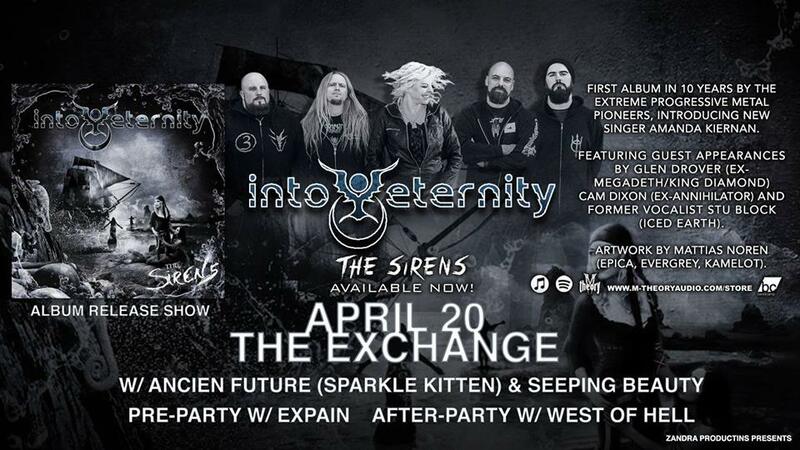 and we will personally be mailing The Sirens to you! Thank you to all our die hard fans out there that have stuck with us through almost a decade waiting for this album. Its been extremely difficult sitting on this and we decided that this album needed to come out. This is the first recording we’ve done with Amanda and her vocals are incredible. Also new on this album is the insane drumming of Bryan Newbury and guitar shredding of Matt Cuthbertson! We are very proud of this album and we hope you love it as much as we do. Happening now: touring Western Canada! 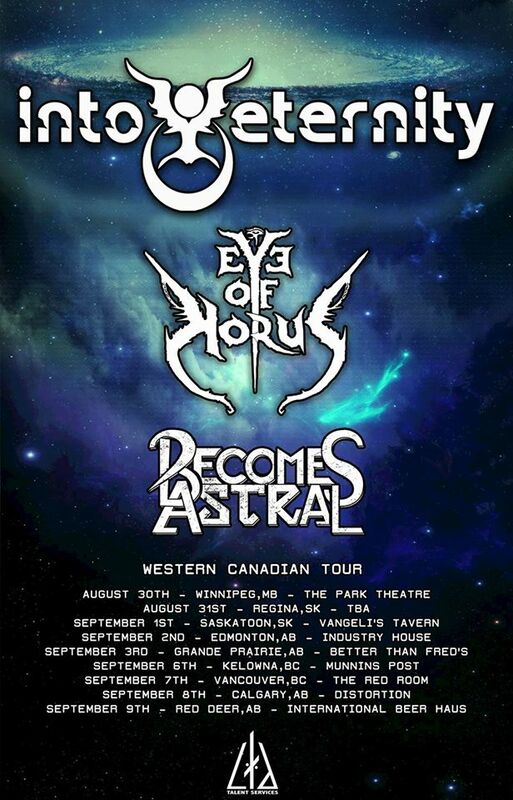 Into Eternity is excited to start this late summer tour in Western Canada right now! We’re being joined by Eye of Horus and Becomes Astral. It’s gonna feel good hitting the stage again with these fine humans. We hope to see all of our long time friends and fans at these shows. In regards to the way too long awaited album, we’re still working on it. I guess your gonna have to come to the shows to hear some new music! Thanks to Ryan Walraven and LTD Entertainment for making this tour happen, this is gonna be a blast!